Out of the 380 Premier League games this season, 98 could be classified as derby games – 56 in the north-west, 20 in the Midlands, 20 in London and the two between Newcastle and Sunderland in the north-east. There are five derby games this weekend: Blackburn v Bolton and Wigan v Everton in the north-west, West Brom v Aston Villa and Birmingham v Wolves in the Midlands, and Chelsea play Tottenham in London. Manchester United have the best derby record in the league, having gained 27 points from a possible 36 from 12 north-west matches so far to collect 75 per cent of the derby points on offer. In their 12 derby games, United have won eight, drawn three and only lost the one game, at Anfield. United, on this derby form, will relish the fact that their final games of the season are at Blackburn and then at home to Blackpool. A full divisional breakdown of derbies is in the table below. Chelsea and Newcastle are next in line as derby princes, having gained two-thirds of the points from their all-London and north-west matches respectively. (Yes, we know Newcastle have played only two such games to Chelsea’s seven so far, but we can only work with the numbers we have). Fulham come out worst from derby games across the whole division having only gained two measly pitiful points from their seven all-London games played so far. The two points came from draws at West Ham and at home to Chelsea. Fulham will be hosting Arsenal on the last day of the season in an effort to chalk up their first London derby victory since beating West Ham at their Cottage on 2 May last year. 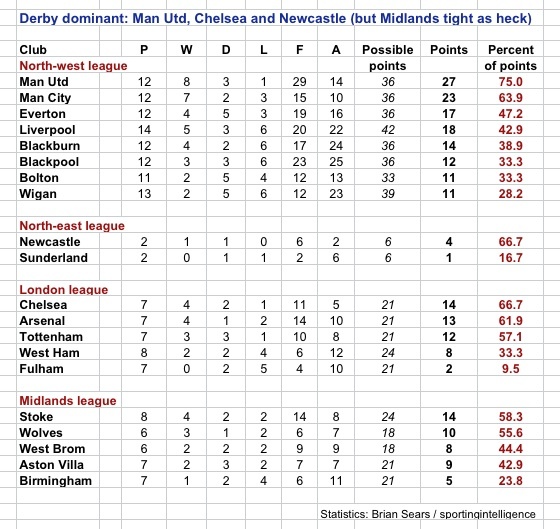 The Midlands has thrown up the closest derbies as a region, with the best team, Stoke, collecting only 58.3 per cent of points to top the Midlands table, which isn’t a massively superior record compared to Wolves, West Brom and Aston Villa next. This weekend’s games could shake up that particular table.